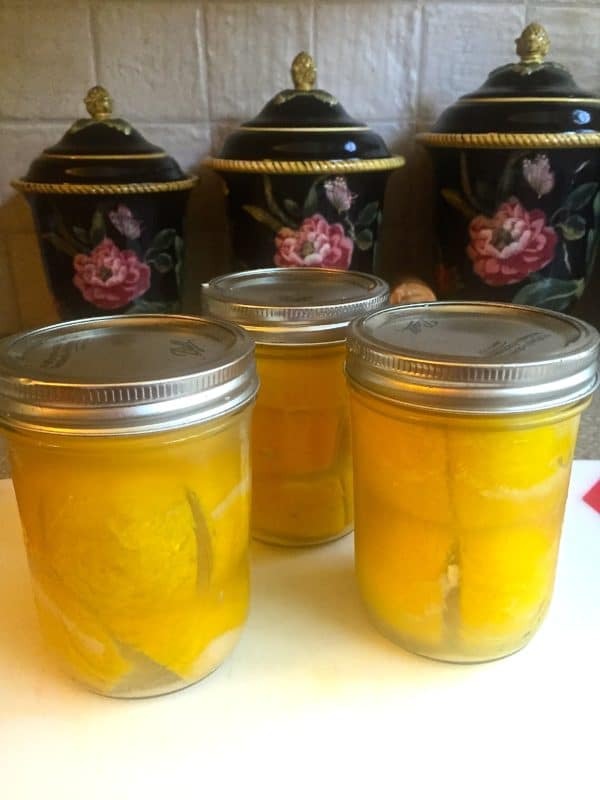 Preserved Lemons are my new favorite secret ingredient and I know you will love them too! 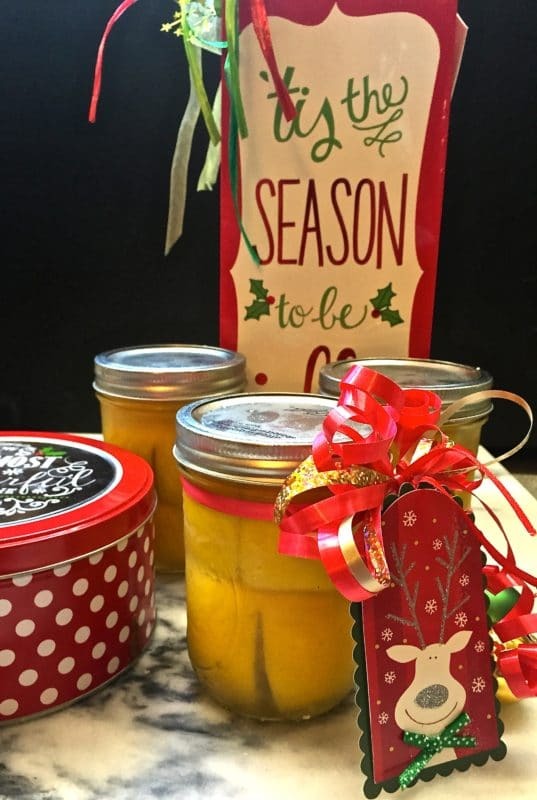 You won’t believe how easy they are to make and they make terrific edible gifts for your foodie friends. And yes, if you are wondering, in addition to lemons, you can also preserve limes, oranges, and grapefruit. It’s is a fabulous way to have winter citrus all year long. In North Florida, we are having a bumper crop of citrus this year and preserving it is a great use for all of the excess fruit. 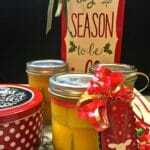 If you have never used Preserved Lemons in your cooking, you are in for a treat. Think about the wonderful flavor that lemon or citrus zest brings to a dish and multiply it by 100! Preserving lemons brings out their lemony essence, and you can use them in almost any recipe in which you would be adding lemon zest or juice in order to heighten and brighten the flavor. Preserved Lemons have been used for centuries in Indian and North African cuisine, and are an essential ingredient in Chicken Tagine. But once you try them, I can promise you they will become an essential ingredient in your dishes and deserve a place of honor in your kitchen. If you don’t want to make Preserved Lemons, you can buy them in specialty food stores or online, but they can be expensive. A quick search on Amazon shows they run around $13 a jar. But they are so easy to make, I hope you give them a try. Your family will thank you and any friends that receive them as gifts will be eternally grateful! I’m a little embarrassed to even call this a recipe, it’s so easy. And, there are only two ingredients! Yes, you read that right. All you need are lemons or other citrus and kosher salt. You will also need some wide-mouth mason jars with lids. To make Preserved Lemons, first, wash and dry the fruit. Trim 1/4 inch off the top and bottom of each lemon. Split each lemon lengthwise into quarters, being careful not to cut all the way through at the bottom. The quarters should still be connected to the base. 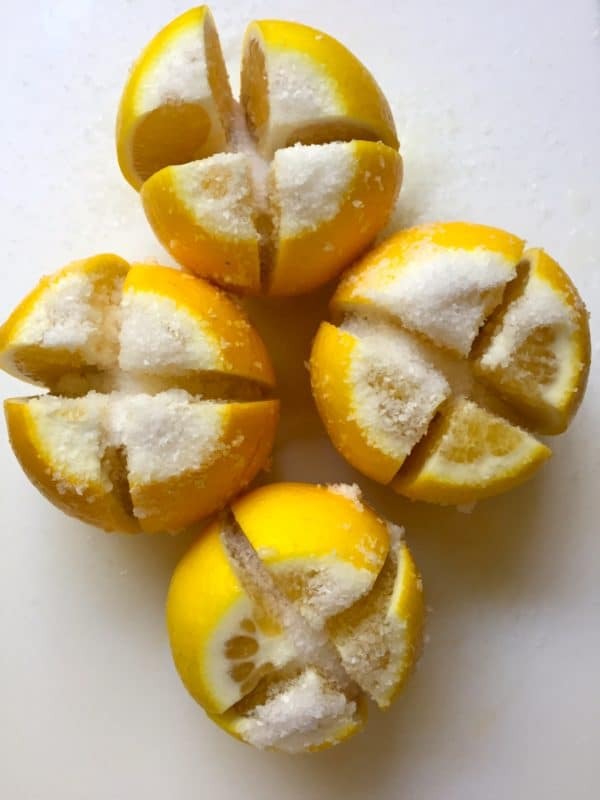 Spoon a generous amount of salt into and on the split lemons and place them in a large bowl or plastic bag. Refrigerate overnight. The salt will cause the lemons to release a large amount of juice which is what you want. Place the lemons in sterilized mason jars and mash the lemons down firmly to fit as many lemons as possible and to release even more juice. The lemons must be completely submerged in the lemon juice and salt mixture. If not, you will need to add more freshly squeezed lemon juice. Seal the jars and store in the refrigerator for at least 4 weeks and up to 6 months or longer. The longer you wait to use the lemons the more their flavor develops. To use the lemons in a recipe, remove a lemon from the jar, rinse well and scrape the pulp and any seeds away from the peel. Finely mince the peel and use in place of lemon zest. You can use this same recipe to preserve limes. However, to preserve oranges, tangerines, or satsumas you will need to add lemon juice because their juice by itself isn’t acidic enough to preserve the peel. To sterilize jars, wash them with hot sudsy water and rinse well. Place clean empty jars in a large pot and completely cover the jars with water. Bring to a boil over high heat. Once the water reaches a full rolling boil, boil the jars for 15 minutes. Turn off the heat and let the jars stand in the hot water for about 30 minutes. Remove from the pot and fill while they are still hot. You can sterilize the lids in boiling water for 5 minutes. Preserving lemons brings out their lemony essence, and you can use them in almost any recipe in which you would be adding lemon zest or juice in order to heighten and brighten the flavor. Wash and dry the fruit. Place the lemons in sterilized mason jars and mash the lemons down firmly to fit as many lemons as possible and to release even more juice. The lemons must be completely submerged in the lemon juice. If not, you will need to add more freshly squeezed lemon juice. To sterilize jars, wash them with hot sudsy water and rinse well. Place clean empty jars in a large pot and completely cover the jars with water. Bring to a boil over high heat. Once the water reaches a full rolling boil, boil the jars for 15 minutes. Turn off the heat and let the jars stand in the hot water for about 30 minutes. Remove from the pot and fill while they are still hot. You can sterilize the lids in boiling water for 5 minutes. So cool! I want to make these lemons STAT! These would be great to keep on hand to liven up everything from pasta to cocktails! Mmmmm! Preserved lemons sound wonderful! I'[d love to get these as a gift! Great idea! I’ve been meaning to make preserved lemons for years but never have – I really should get my act together! Could I potentially Water Bath can them and then store them in a cool dark place? I have limited refrigerator space, and do a lot of fruit canning (jams, jellies, etc…). If so, how long do you think I should process them? 10 to 15 minutes? Honestly I’m not sure. I’ve never done this so I really can’t comment on whether this would work or not. Preserving the lemons makes the peel really soft and pliable and you can squeeze a lot of lemons in a pint jar. When they are preserved they will last up to a year in the refrigerator and my guess is if you have either a quart or two pints they would last you for the year if that helps any. Sorry I couldn’t be more help! Hi Renee, I was thinking about your question and realized that I had misunderstood your original question when I sent you my reply. I have never done any canning so I can’t say for sure, but I looked at several web sites and it seems like there is no reason your method wouldn’t work. Good luck, let me know how it goes! You will love having the preserved lemons and there is no end of dishes you can use them in.